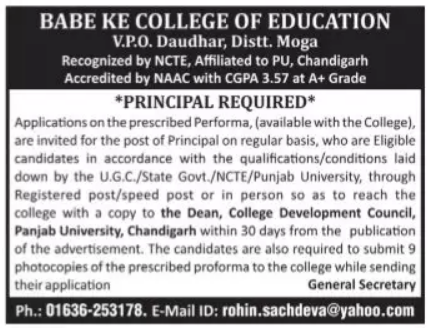 Babe Ke College of Education, Moga has advertised in the TRIBUNE newspaper for the recruitment of Principal jobs vacancies. Interested and eligible job aspirants are requested to apply within 30 days from 19th Sept 2018. Check out further more details below. About College: The Babe Ke College of education was started with a mission "To Produce High Spirited Teachers Imbued with Missionary Zeal" in village Mudki of Distt. Ferozepur in the state of Punjab in 2006. The village Mudki has it's historical significance where the last Sikh battle was fought between Maharaja Ranjit Singh and Britishers in December 1845. It is very much known for having it's existence near the Holy Land of renowned Sufi Saint Baba Farid, the man of high spirit who spread the fragrance of universal brotherhood and communal harmony. How to Apply: Interested and eligible candidates are requested to send their application in prescribed proforma (available in the college) along with copies of certificates and testimonials with recent passport size photo to the following postal address through registered post / speed post. Submit 09 copies of applications to the college address.